Today marks 4 years since my Dad succumbed to kidney cancer. Each year during December and January, I seek out methods of escape – excessive socializing, which can include excessive alcohol consumption. I am not a regular drinker, but this time of year I want to forget the memory of death. Once the New Year arrives I tire of the toxicity and I enter this state of quasi-mania – irrational outbursts may happen, misdirected anger, random sobbing. All of which I am told is a form of PTSD. Unfortunately, cancer is so ubiquitous that some of you may relate. Watching a loved one become unrecognizably weak, hallucinating from the pain killers, and confined to a hospice bed, is a memory that will not soon escape the mind. My dad was a phenomenal athlete. As a kid he was an all-star baseball & basketball player. He was a scratch golfer, going to the NCAA tournament in college, after taking 1st in the State of Minnesota. Growing up, he encouraged health & fitness, wanting his girls to be tom-boys and his son to be as stellar as he once was. He lived vicariously through our activities. As we left the house to continue our own lives he continued hiking, lifting weights, shooting hoops & golfing. So, to be unable to stand, his brain muddled with ridiculously strong pain killers, made me feel so sad for this man who had so much dignity & pride in care-taking. He wanted nothing more than to watch his family grow old; to see the day when he could bounce a grand-baby on his lap; to watch his business flourish to the benefit of his employees and his family. He was not ready to leave this world. In addition to these physical traits, my Dad was extraordinarily spiritual. He had a very strong affinity for the teachings of Jesus and for the wisdom of the Native Americans. He participated in vision quests and avidly read texts about the Great Spirit, and the importance of nature and our loving interaction with all living beings. His devotion to spirituality undoubtedly influenced me – I have always had a yearning to help people. In his last days, one of the few things he said with clarity, was that we need to help people. He was the most generous, funny, loving person I’ve ever met – and I’m not just saying that because he was my Dad. He connected with people on a level that is rare to find – if you speak with anyone who knew my dad, they all believed he was their best friend. 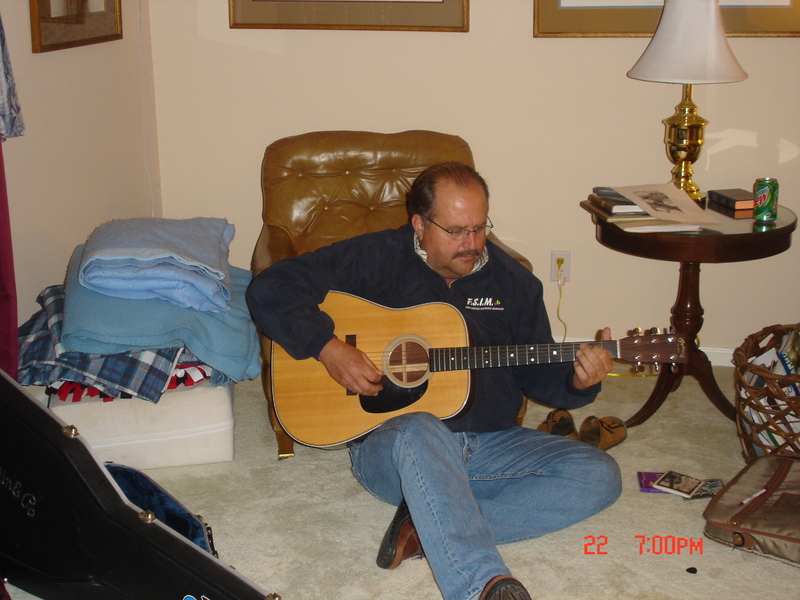 Dad was also a singer/songwriter and loved poetry. He wrote love songs to my mom when they first started dating. He taught all of his children to sing, harmonize & play instruments. Music is such a huge part of my life & my soul and it is the one place where I can most closely connect with my dad’s spirit. After this weekend’s discussions and exercises, I cannot put into words how joyful I am to have endeavored into this self-exploration and humble absorption of information. The discussions of Spaciousness are exactly what I need in my life. I desire greatly for the grace of observation during my moments of mania. To share this concept with my mom, sister & brother, so that they may find some peace during their own mania. Again, thank you all for listening, for being present and for creating a place of open acceptance. It’s more than I could have ever wished for. What are Samskaras? How do I experience them myself? Samskaras are habitual, unconscious patters of attachment & repulsion. These patterns or habits are held deep inside of our psyche, which manifest in our physical body as patterns of dis-ease, holding or tension, etc. For many years I believed that I had chronic acid reflux & that there were certain foods that caused this dis-ease & discomfort. In fact, I was diagnosed at age 19 with GERD (gastro-esophogeal reflux disease). I was told that if GERD went untreated it could lead to cancer. Fearfully, I convinced myself that if I ate poorly (too much grease, fat, alcohol, etc) that I would get “sick”. I would even say it out loud – “I can’t eat at that restaurant, the food will make me sick”. I created a pattern of attachment to this concept of “sickness” & repelled all things that would cause me to suffer. In reality, I was trying to justify not eating certain foods, which fed my obsession over what I was eating, in an attempt to stave off cancer & to stay fit & trim. After 8 years of daily medication for acid reflux, I decided that I did not need this medication anymore. I stopped taking it cold turkey, and 2 years later, I have not needed it. At the time I was “diagnosed” I had a series of obsessive behaviors that created a lot of unnecessary stress. After practicing yoga for a number of years, I became aware of the power of the mind. Thus, a mental pattern of thought, created a physical ailment. The only way to stop the physical ailment was to change the pattern of thought. It took me a couple of years, but eventually I broke this pattern. Very little in my diet has changed since I began taking the medication – it was mostly a psychological creation. Today begins my first blog of many over the course of this new endeavor, Yoga Teacher Training. I feel like the ground after a long fall season – I’ve been I covered in a pile of thick, wet, dirty leaves and now I will slowly scrape away. Allow the soil to breathe and prepare for the new growth that the spring will inevitably bring.